The original model produced over the last 60 years. 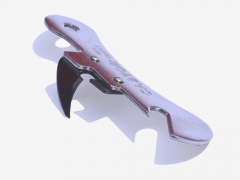 Stainless steel handle. Blade in hardened carbon steel (hardened stainless steel in option). Guaranteed cuttinf quality. Ideal for right-hand users as well as left-hand users. Each peeler can be personalized by putting your own marking or labeling or your gencod. 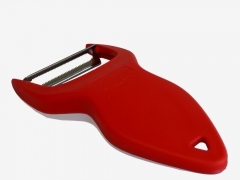 With a mobile hardened double edged notched blade, the peeler follows the fruit's shape. Especially designed for tomatoes, it is efficient as weel for kiwis. 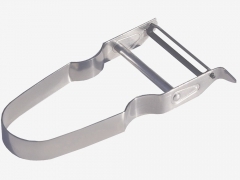 The company Rusillon has experience of over 70 years in the manufacture of potato peeler. The adventure began with the famous CASTOR, potato peels, which owes its name to the small animal with sharp teeth. The strength and sharpness of the teeth of Castor best represent those of the peeler.